The 9 exotic islands of Tokyo. Most islands can be reached within 2 hours from the city! Izu Oshima, Izu Islands is an island packed with charm that is only one and a half hours away from Tokyo. With Mt. Mihara at its center, the town was built in its surroundings. One of its major attractions are onsens, or hot springs. While there are a few onsen spots on the island, there is one where you get to see both mountain and horizon in a single view. 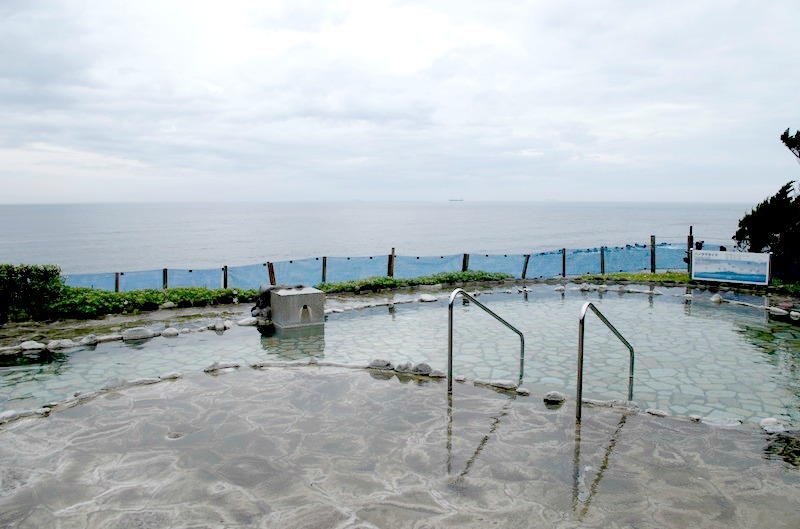 An onsen that brings together all of what’s beautiful about the island, I would like to introduce you to ‘Hama-no-yu’. 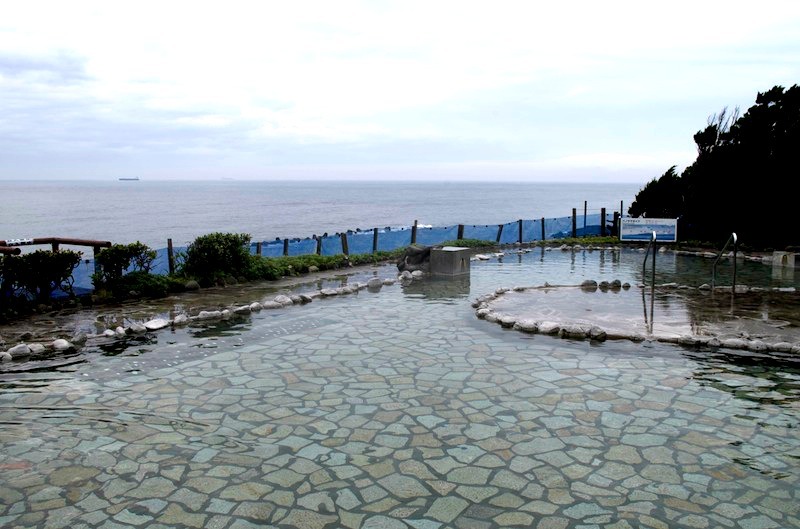 A mixed open air onsen, right by the sea! A 4 minute walk from Motomachi Port. 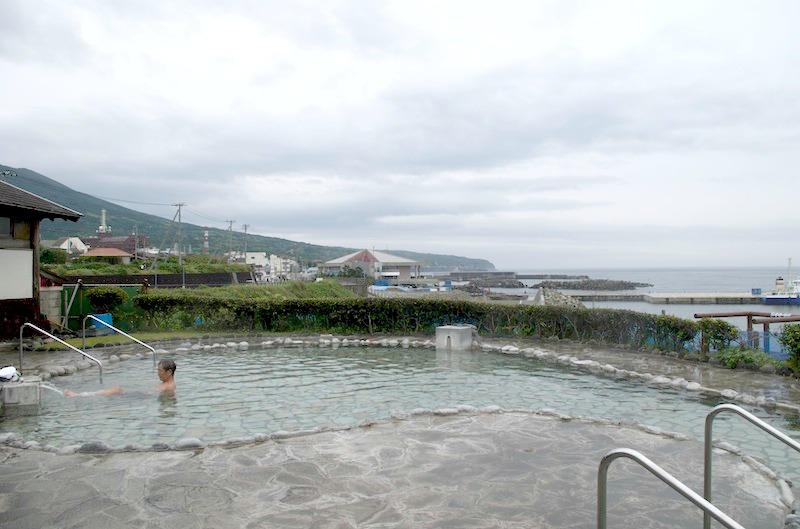 ‘Hama-no-yu’ is the only mixed open air onsen in Izu Oshima. It’s close to the port and easily accessible, making it a favorite among locals too. The stretch of water in front is so clear and bright blue, it’s no surprise the onsen is popular for its view. Breath in the fresh air and stop to take in this moment of relaxation. Another popular feature here is the fact that it’s great for mixed gender groups, families and couples. It’s an open air onsen where you are required to wear a swimsuit, which means everyone can enjoy a dip in the onsen together. In general, we advise you to bring your own swimsuit, but it is possible to rent one too. When traveling, it’s often the case that you don’t get to enjoy onsens together as you get split by gender, but here you do, and it even comes with a spectacular view. That’s not the only attraction here. At ¥300 for adults and ¥150 for kids, entrance fee is very much affordable (price from time of writing in Oct, 2017). You get to relax, take in the view of a beautiful horizon, and if the sky is clear enough even catch a glimpse of Mt. Fuji, all for this price. The most popular time is in the late afternoon when you can catch the sunset. The sun setting into the Pacific Ocean is so beautiful you will be lost for words. It’s not uncommon for people to swing by for one final dip at this hour before boarding the ferry to take them back to Takeshiba Port in Tokyo. 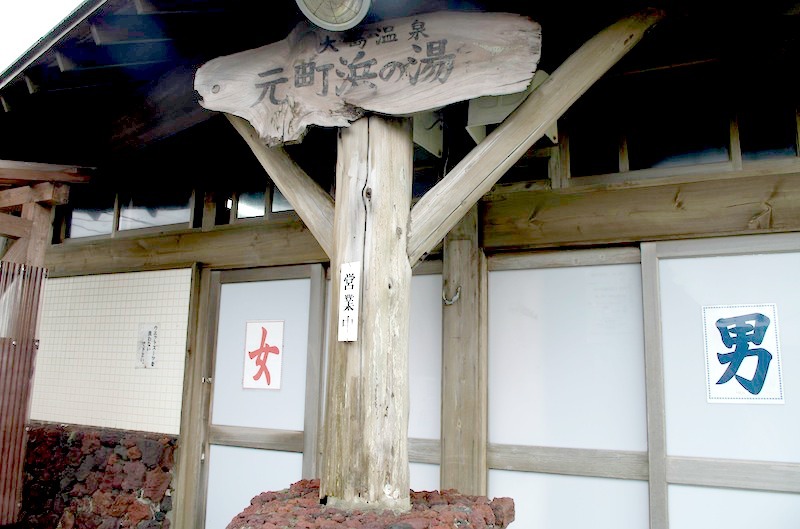 As Hama-no-yu is a natural onsen that sprung when Mt. Mihara erupted, it’s highly recommended for women as the water leaves your skin smooth and silky. After paying your entrance fee, go into one of either male or female dressing rooms to change into your swimsuit. There are shower rooms inside where you are required to wash your hair and body before entering the onsen. There is a soap bar, but there are no shampoos so you will need to bring your own. 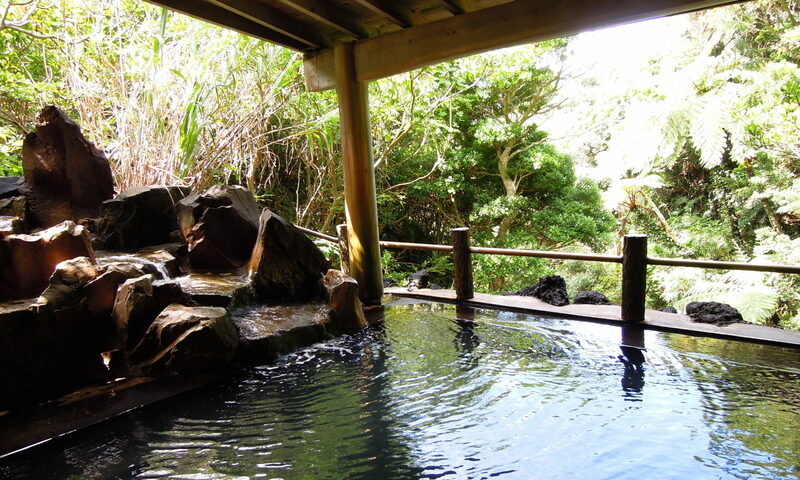 Wash yourself clean and head out to the open air onsen! Open the doors to find a grand view of the ocean with Mt. Mihara in the background. The warm water soothes your body, and the surrounding nature and fresh air will help heal mind and spirit. The sense of freedom will make you want to chat with whoever is next to you, while the convenience of being able to pop by at any time makes this place irresistible. 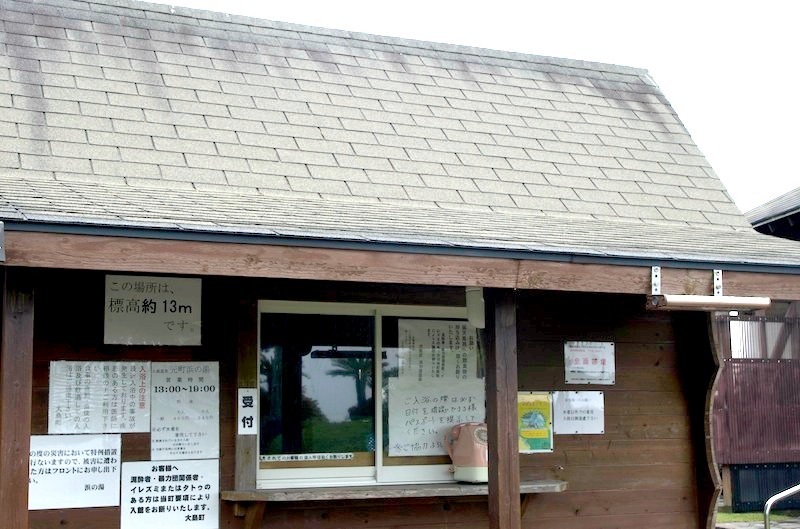 On the occasion that you visit Izu Oshima, I really would recommend a visit here. No doubt it will be a great trip for both men and women! If you want to know how to take an onsen, then “here“. Requests only for return tickets with outward journey starting in Tokyo. This service only handles reservations of return tickets departing from Takeshiba Terminal in Tokyo. Call to make reservations for other ticket types. Reservations can be made up to 2 months in advance of departure date. If departure date is August 1st, reservations can be made starting June 1st. If departure date is August 4th, reservations can be made starting June 4th. Please check ferry schedule, fare and availability of seats before filling in your preferred date and time. Please check the "ACCEPT" button after confirmation by the above by all means.